This is Betty with her sister, standing at a powerful dreaming place. The Gija view the land as fully alive, vibrating with energy. When you accompany Aboriginal people to their land you will notice how much they care for it. They will point out certain sites and tell you its creation stories. 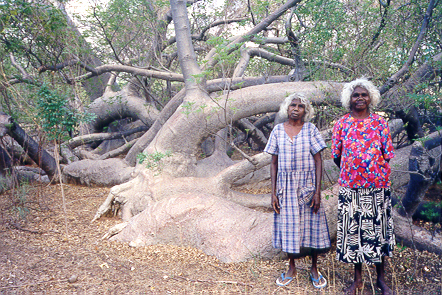 You will learn about where to find bush food and plants that can be used as medicines. People will tell you their personal histories, where they or their ancestors used to live, what happened in the past. They may take you out fishing. Most important is that you are welcomed to the country. That the spirits know about you so that they won't harm you. The Gija always 'bless' visitors before entering sacred country. They pour water (from a stream) over their heads and talk to the spirits in the local language. If visitors would enter certain sites without permission, dangerous powers may be released. According to Aboriginal people the world was shaped in the Dreamtime: a creative epoch during which the formless was given form. Ancestral beings rose up from beneath the earth to travel the land and give shape to it. They created its topographical features, sang the names of plants and animals, instituted the rules for life, invented songs, dances and paintings that commemorated their acts, and created the human beings who would succeed them. When their work was ended they returned to their place of emergence, certain sites in the land, where they still are and participate in the becoming of things. The Dreaming, called Ngarrangkarni by the Gija, is as much part of the present and the future as it is of the past. The Dreaming may be compared with our Big Bang-theory. Just like the Big Bang was there suddenly and contained the 'soup of life', so did the world according to the Dreaming ontology come into existence from a formless substance. In both instances life evolves out of a common source and becomes more complex, either through evolution or through the acts of the ancestors. And similar to scientists' hypothesis that the universe is still expanding, the Dreaming has never been perceived as 'finished'. The forces that materialized the world are still alive and present, even though roads nowadays run through Gija country and airplanes fly over it. Also akin to scientists' recent discoveries in quantum physics, Aboriginal people have always regarded all things as interconnected. It is from this belief that totemism, te connection between human beings and animal species, originates. According to the Gija, everything that is, derives from the Dreaming. Goolarbool, the Rainbow Serpent, is the most important ancestral being. As a carrier of fertility (s)he curved out the rivers and pools and placed spirit-children in some of them. Before a spirit-child enters the womb of a woman it is often temporarily incarnated in some kind of animal that lives close to the waterhole. This animal (djerin) is the conception totem of the child. It usually presents itself to the father or mother in a dream. The child will always be associated with this animal as well as with the waterhole his or her spirit emerged from and will return to after death. The connection people feel with their land is therefore very strong. The land is not perceived as an object outside oneself, but as part of oneself. "I can feel my country in my djaan" (heart), people often told me. Elder Patrick Mung Mung once told me how much he loved his country and how strong he sensed his relatedness to the waterhole where his spirit used to reside: "I went to Darwin and water became dirty, but when I came back to the water I could see it clear up, right in the middle. Fish was coming up to me." The relationship between land and self is thus mutual; the one can act on the other. Spirit places are perceived as places where one can replenish one's energy. Since Aboriginal people feel so intimately related to the land, they also feel highly responsible to care for it and nurture it. If they lack in doing so, the natural balance may be disturbed. Seasonal ceremonies are performed to celebrate and encourage the life forces in the land and to pass on knowledge to younger generations. Such ceremonies are led by elders who are recognized as 'holders' of country. They know the stories that belong to certain places, the associated rituals, songs and designs. Their knowledge is considered neccessary for the continuation of life. They know how to communicate with the ancestral spirits and how to influence natural powers, for example to release the rains. Every year children in Warmun are 'passed through the Law' to learn about their identity and responsibilities. 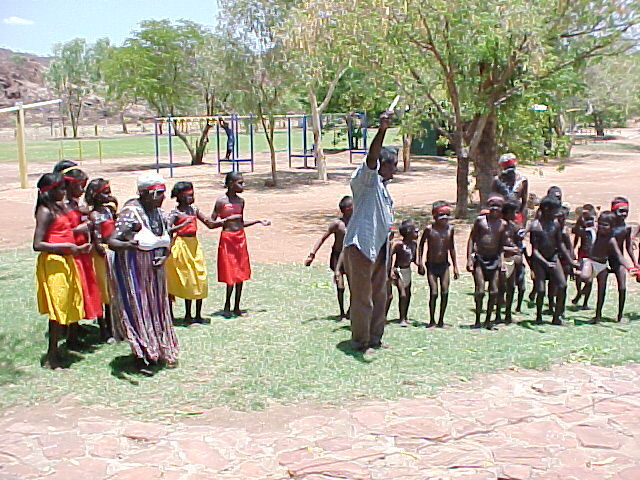 At the local school in Warmun they are taught their language, Gija, as well as western subjects. A few times a year they take part in corroborees, ceremonial dances, which is always lots of fun! Many indigenous, colonised peoples struggle against destructive economical activities in their land, such as mining and the cutting of forests. 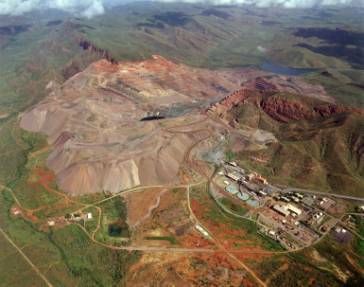 Lake Argyle Diamond Mining was established in Gija country in the early 1980's. Only a small number of the traditional owners signed an agreement with the mining company and the remainder of the group had no idea of what was about to happen. They were in great shock when they discovered that in the search for diamonds the women's sacred site, the Barramundi Dreaming, was being destroyed. They do receive financial compensation but the strong sense of spiritual loss can not be recovered. In the meantime, the Gija protect the workers in the mine against dangerous ancestral harm by performing blessings for them.